50% performance improvement on multi-threaded workloads, enhancing overall system performance compared to the previous platform. The Intel Mehlow platform also includes support for the latest Intel Xeon® E processors (Coffee Lake-S), which are designed to provide small and medium-sized businesses high performance for professional workloads, combined with leading reliability and security. With the new Intel Mehlow platform, Intel Xeon E processors provide better support for features such as 4K UHD video rendering, suitable for content creators. The WS C246 PRO workstation motherboard features four PCIe® 3.0 x16 slots to support professional graphics cards and add-on cards, such as RAID controller and LAN cards. Featuring dual M.2 slots to unleash maximum next-gen data-transfer speeds, WS C246 PRO supports up to 32Gbps performance and data redundancy. It also supports up to three independent displays and comes with dual Intel LAN ports. Altogether, these features offer users more expandability and flexibility to fit their various needs. 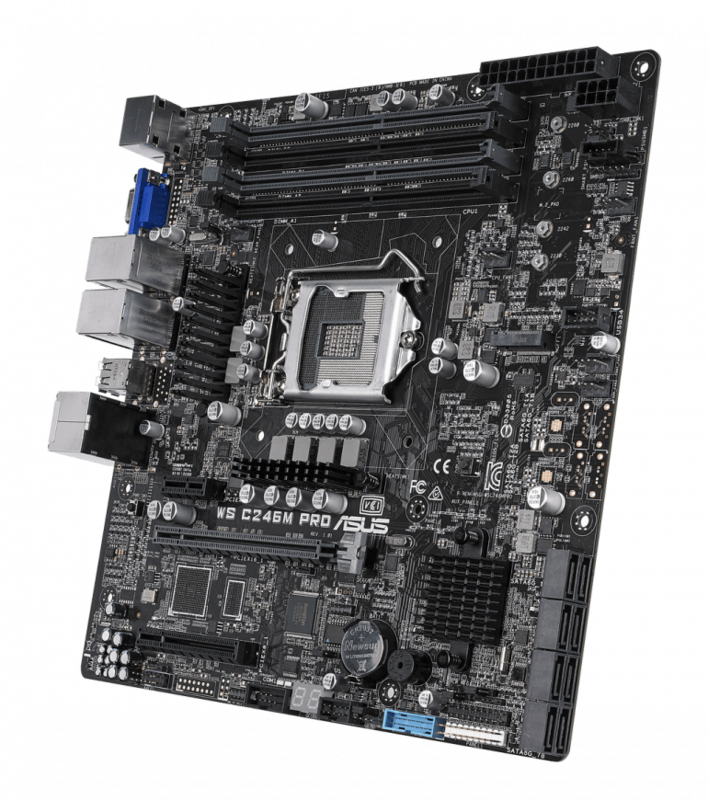 In addition to WS C246 PRO, the Micro-ATX WS C246M PRO workstation motherboard is also available, giving users powerful workstation performance in a smaller form factor. Its rack-optimized design maximizes cooling efficiency for the best performance and stability, ensuring it’s ready to meet the demands of always-on usage scenarios. WS C246M PRO features one M.2 slot, which supports up to 32Gbps data-transfer speeds with native NVMe — up to 5.3X faster than traditional SSDs. The ASUS E500 G5 and E500 G5 SFF workstations come in two sizes — tower and small-form-factor — and deliver high-end performance for business applications. Both workstations are built upon the Intel Mehlow platform and feature Intel Xeon E2100 series processors to empower users with faster, more efficient performance. E500 G5 and E500 G5 SFF support multiple graphics cards including NVIDIA Quadro and AMD Radeon Pro and have independent software vendor (ISV) certification to ensure the best reliability and compatibility with software from a wide range of companies, such as Adobe, Autodesk, and SolidWorks. The new Intel Mehlow platform workstation product series come with ASUS Control Center (ACC), a centralized and integrated IT management platform that enables asset and security management, remote BIOS updates, monitoring of multiple systems via mobile devices, and one-click software updates and dispatching, allowing easier management for any IT infrastructure.